Good morning! Breaking Tuesday, via Bloomberg: "French President Emmanuel Macron’s government reversed course and suspended a planned fuel-tax hike that had sent as many as 300,000 protesters into the streets for three weeks in sometimes violent clashes." Breaking Tuesday, part 2: Audi said today that it's investing almost $16 billion through 2023 on "electric mobility, digitalization and autonomous driving." TechCrunch has more. It's kind of a cliche — albeit an accurate one — that climate is rarely the tip of Democrats' political spear. Pew Research Center polls consistently show it's far from the public's top priority. 1. Congress: Alexandria Ocasio-Cortez, the progressive congresswoman-elect from New York City, and activist backers have been vigorously pushing for incoming House Democrats to craft a sweeping bill that's ready for launch in 2020. Her proposed "Green New Deal" includes a transition to 100% renewable power. At the same, activists led by the emerging Sunrise Movement are trying to prevent Democratic Sen. Joe Manchin from becoming the ranking Democrat on the Senate's energy committee, as they consider the West Virginian to be too pro-fossil fuels. 2. Early 2020 election moves: Last night, Sen. Bernie Sanders made climate change the focus of a "town hall" forum on Capitol Hill (with Ocasio-Cortez among the speakers). Meanwhile, Washington State Gov. Jay Inslee, via this new Rolling Stone interview, offered the latest signs that he's weighing a climate-themed campaign. Elsewhere, billionaire activist Tom Steyer is mulling a run that would likely play up the topic, even though these days his political work is far broader. The big question: Whether this represents any kind of sustained shift, or whether, as 2020 draws closer, climate will fall back to its traditional second-tier (or third-tier, etc.) status in national politics. Screenshot of chart from Morningstar report, "EVs, Pot, and Data: Can They Save Electricity Demand?" 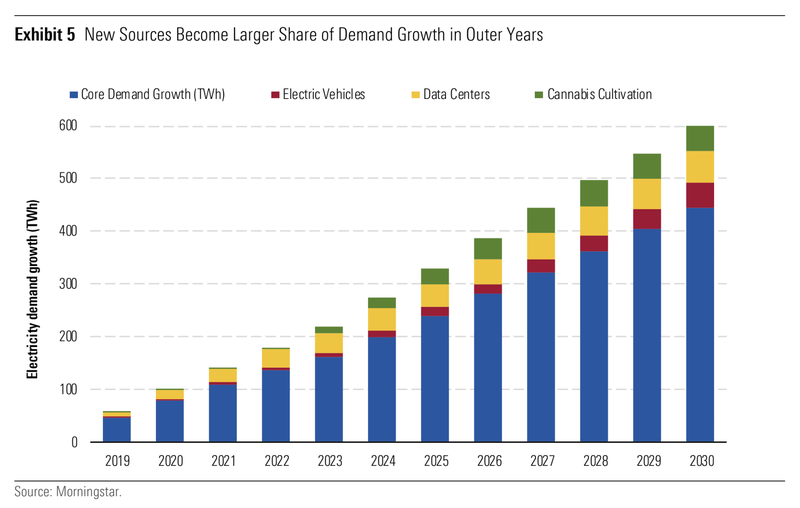 A new Morningstar note explores 3 reasons why they see U.S. power demand rising through at least 2030: new demand from growing pot, charging electric cars, and powering data centers. Why it matters: The note shows how the power grid is facing new challenges even as the overall energy efficiency of the economy grows — and how some utilities can benefit from new markets for their energy. The analysts note sees those three sectors growing to reach 6% of total U.S. power demand by 2030. Threat level: "The most successful utilities must attract these industries by investing in grid expansion, smart networks, safety, reliability, and renewable energy during the next decade," it states. The emerging consensus about Qatar's decision to leave OPEC is that it means almost nothing and a great deal at the same time. Where it stands: Over at the Atlantic Council, energy expert Randolph Bell notes that "from a market perspective this really doesn’t mean anything," because the country is such a minor oil producer at around 600,000 barrels per day. Why it matters: "It does signal a weakening of OPEC at a time when it is in some ways less powerful than it used to be but also more crucial in balancing the market because US production is so strong," Bell said in the Q&A on their website. Bloomberg columnist Liam Denning agrees, writing: "[T]he symbolism of a long-standing, Middle Eastern member leaving is inescapable." "OPEC’s world has changed, and the organization is ill-equipped to cope. The mere fact it relies on a clutch of non-members, especially Russia, to make its presence felt tells you a great deal about its difficulties," he adds. The big picture: "Qatar is not a founder member, but it was the first to join the original five of September 1960, entering in 1961. It is the first Middle Eastern member to depart. There are, though, precedents for countries leaving the organisation," writes energy analyst Robin Mills in The National. The International Energy Agency said Tuesday that combined carbon dioxide emissions from the world's advanced economies are set to rise 0.5% in 2018, ending a 5-year declining trend. Why it matters: It's another data point in the wider picture of overall global emissions that began climbing again in 2017 after a 3-year plateau, even as scientists warn of the need for steep emissions curbs in coming years and decades to prevent high levels of warming. "Based on the latest available energy data, energy-related CO2 emissions in North America, the European Union and other advanced economies in Asia Pacific grew, as higher oil and gas use more than offset declining coal consumption," per the report. Threat level: IEA called the data, which arrives alongside the major UN climate conference getting underway in Poland, "particularly worrisome for global efforts to meet the Paris Agreement." What's next: IEA also expects emissions from developing nations to be higher again this year. While fuller data won't be released until March, "all indications point to emissions growth globally," IEA said. Two announcements hours apart from two oil giants underscore that while the industry is slowly changing its tune on climate, truly seismic changes to its business model aren't underway. Driving the news: As we reported yesterday, Royal Dutch Shell is bowing to activist investor pressure and will set near-term carbon emissions targets. It's also linking executive pay to emissions performance. Just hours after Shell's rollout on Monday, Exxon announced that new discoveries have significantly boosted the estimate for its massive offshore Guyana find to an eye-popping 5 billion barrels of oil-equivalent (more on that below). The big picture: Shell's move is another sign that European-based multinationals have staked out a more proactive stance on climate than the U.S.-based global giants. But while natural gas is playing an increasingly large role in Shell's portfolio and they're making more moves in electricity and EV charging, don't think for a moment that any oil major would not be happy with Exxon's success off Guyana's coast. And indeed Shell has been among the majors that has snapped up acreage off Brazil's coast, where there are huge hydrocarbon deposits in pre-salt formations. The bottom line: Despite scientific warnings about the need for steep global emissions cuts in the near-term, the industry's investments are far more aligned with meeting growing oil demand. Quick take: That makes a lot of sense for the world as it is. The IEA's recently released World Energy Outlook reiterates warnings that higher investments in new oil production projects could be needed to avoid a "supply crunch" down the road. Axios' Steve LeVine has a little more on Exxon's growing find off Guyana's coast that as of yesterday had grown to an estimated 5 billion barrels of oil-equivalent — a 25% boost over the assessment just a few months ago. What's happening: The story goes back to 2006, when explorers discovered a big oil reserve offshore from Ghana, on Africa's West Coast. That ignited an industry frenzy. Recalling the breakup of Pangaea, the ancient supercontinent (see the image above), drillers knew that if there was oil in Ghana, it might also be found near South America's East Coast, which until 200 million years ago was fused to Africa. Trump administration officials are set to tout coal, natural gas and nuclear power at an event during the UN annual conference currently underway in the old coal-mining Polish town of Katowice, Axios' Amy Harder reports. Possibly someone from the natural gas industry. A DOE spokesperson confirmed Winberg’s participation. What’s next: Amy will be in Katowice beginning Dec. 9. Negotiators are looking to make progress on the technical aspects of the 2015 deal, which goes into effect in 2020. As I noted above, an early flashpoint heading into the new Congress is over Sen. Joe Manchin's possible ascension to top Democrat on the energy committee — and potential chairmanship if the party takes the Senate in 2020. The latest: Some climate activists are pressing Senate Minority Leader Chuck Schumer not to let that happen, and young demonstrators with the Sunrise Movement gathered outside his New York City office yesterday to make their case. Quick take: It's something of a tempest in a teapot, but more on that in a moment. Where it stands: Manchin has a path if the current top Democrat on the committee, Sen. Maria Cantwell, wants the ranking slot on the Commerce Committee next year (which is open because Sen. Bill Nelson lost his re-election). Meanwhile, other energy panel Democrats with more seniority than Manchin look keen to keep their ranking spots elsewhere for now, including Sanders on the Budget Committee. My thought bubble: This is much ado about ... not all that much. Manchin isn't likely to prove pivotal to trajectory of a sweeping climate and energy bill. There's only one obvious avenue for Democrats to pass major climate legislation absent a major shift in GOP thinking: Taking the White House and the Senate in 2020 and keeping the House. If that happens, Manchin's position won't be pivotal even if he's chairman — and even that's a big "if" because a more senior member could decide to shove him aside if Democrats regained the chamber. Large portions of this hypothetical bill would likely be written in other committees — notably Environment and Public Works, and Finance (which controls tax policy). Energy provisions that Manchin opposes could still be added on the floor through amendments. But, but, but: If lefty activists are hoping to see Democrats lay the PR groundwork for pushing through something sweeping if they ever regain full control, it's certainly true that Manchin would be a pretty imperfect messenger. The bottom line: Sure, Manchin's potential role as the panel's top Democrat — and would-be chairman — is relevant. But it's hardly decisive. What they're saying: I asked the Sunrise Movement to respond to my thesis that Manchin's potential role isn't really a big deal one way or the other. "We have 12 years to transform our economy and move away from fossil fuels in order to give our generation a livable future," said Sunrise spokesman Stephen O'Hanlon in an email. "To do that, we need broad, coordinated government action — not patchwork legislation held up by a committee chair backed by the oil and gas lobby," he said.